Happy Balance Val is a dietary supplement from Val Supplements. It is a mood booster lemon-flavored natural drink for depression and anxiety relief. The supplement works to help combat depressed moods, anxiety and feeling overwhelmed. It is believed that low serotonin levels in the brain can contribute to moods similar to anxiety, depression, fatigue, and general negative feelings. Maintaining a stable and healthy level of this neurotransmitter from a mood boosting supplement could potentially help result in a positive mood. 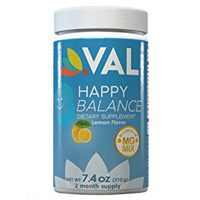 Happy Balance Val contains a combination of magnesium as well as a mix of Vitamin B6 and L-Trypotophan. Vitamin B6 helps to transform L-Trypotophan into serotonin. The end result is supposed to be increased relaxation and improved mood. Taking a closer look at the ingredients, magnesium is an essential mineral that is necessary for the growth and maintenance of bones. It is also necessary for the proper function of muscles, nerves and many other parts of the body. It also assists with bowel movements. Medical studies have found it to be effective for treating constipation, indigestion, magnesium and high blood pressure. Additionally, it may help with relaxation. That being said, there is no strong evidence to support claims about its efficacy for treating anxiety or depression. As for L-Trypotophan, this is an essential amino acid that our bodies can convert to serotonin, and changing levels of serotonin in the brain can alter mood. That being said, more research is needed to determine just how effective L-Trypotophan is for treating anxiety and depression. Early research suggests that it might help to improve the effectiveness of common medications prescribed for treating depression. Nevertheless, more studies need to be conducted to determine exactly how L-Trypotophan may be beneficial for mood disorder. The suggested dosage for Happy Balance Val is to mix 1 scoop daily with water or fruit juice and to take it between meals or as directed by a healthcare provider. Finally, be advised that if you are thinking about trying Happy Balance Val to improve your mood, you should still make the effort to speak with your doctor first before taking it. Mental and/or mood disorders should be taken very seriously. You may need more than a simple dietary supplement to treat your condition. Be open and honest with your doctor about how you feel and your current state of health. Obtaining the proper treatment for anxiety and/or depression is crucial to your wellbeing.